Every once in awhile when I finish a book, I take a moment and ask myself, “What the heck just happened?” That’s not a bad thing. It’s actually a really good thing, in my humble opinion. 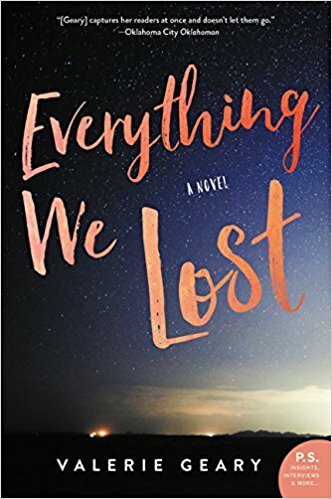 At the end of Everything We Lost by Valerie Geary, that’s exactly what happened. I turned the final page and my brain was exploding with the possibilities of what might have happened. That open-ended scenario made anything possible. Basically, the story lived on in my head, far beyond the author’s last words on the last page. For Lucy Durant, it’s been ten years since her brother, Nolan, disappeared. Over the intervening decade, Lucy’s life has been on a precipitous slope, hanging in the balance between keeping her brother’s memory alive and moving on with her own life. When her father and his new fiance decide that it’s time for her to move out on her own, she revisits the fateful months leading up to Nolan’s disappearance. As she sets out on her own, she takes a detour to reconnect with her estranged mother. Convinced that her son was abducted by aliens, Sandra connects with an alien abduction group to prove that UFOs visited nearby. Lucy tried to reconcile with her mother that the proof she’s clinging to is a cruel hoax. The story flips back and forth in time, alternating between Lucy’s and Nolan’s point of view. Lucy captures her world in the present, while Nolan gives us glimpses of his life leading up to his disappearance. Each is a unique view of the same series of events. Geary captures the paranoia and mania as Nolan truly believes that there are alien among us. Meanwhile, Lucy is trying to reconcile her actions from a decade prior as she tried to stake out her own life free from the shadow of an older brother. That indecision and second guessing after a decade conflicts Lucy and determines her path as she seeks to uncover the truth. In essence, this is a love story set against the backdrop of a mystery story. Nolan finds love in a mysterious girl whom he thinks is an alien hiding from her people and the government. Every shadow is full of secrets and his paranoia gets the better of him. While investigating her brother’s whereabouts, Lucy starts to break down a series of mental blocks that she had assembled to ease her mind about her own actions. She finds love in the memories of her brother. Geary does a fantastic job of creating two very distinct voices between Lucy and Nolan. Each of the characters have their own, very strong identities. Nolan is a very sympathetic character, even through his delusions and antisocial behavior. You want to make him feel better. Conversely, Lucy’s younger self is purposely unlikable. She’s just at that age, and Geary achieves perfection in recreating the popular girl angst. In adulthood, she hasn’t changed that much. Even in her earnest quest for answers, she’s still just that likable. It makes for fascinating reading. I kept reading this book, turning the pages, to get to the bottom of the mystery behind Nolan, his girlfriend, and Lucy. At the end, we’re not given the answer in a nice tidy bow. The mystery extends beyond the page. Lucy finds a new calling in life after coming to terms with her part in Nolan’s disappearance. Life continues on after this book comes to a close. Geary left us enough hints to form an opinion in our minds on what happened. Valerie Geary also wrote Crooked River, which has found a spot on my reading list after reading Everything We Lost. This book was so intriguing that I want to read her other works. This intricate novel was well worth the time spent reading it. Her character and plot building made this a book that I was eager to read. Craig Bacon caught up on some reading during December. Some of the backlog is taken care of, but the list never really gets any shorter.